Native Gardenia, sometimes called a Yellow Mangosteen, is considered to be good bush tucker by the Aboriginal people. It’s a common plant found in coastal forests and beach regions from Far North Queensland down through Mackay, and is a hardy dry rainforest specimen. Its hard-shelled fruits are 6-7cm in diameter, containing a pale, soft and sweet segmented fruit with many small white seeds. Similar to a mangosteen in size, shape and flavour, they may be enjoyed raw on their own or used in salads, tarts, cakes and other desserts. In Spring, the Native Gardenia blossoms with white, beautifully fragrant, star-shaped flowers. These later turn into brown fruit that ripens slowly over Winter, turning yellow when ready for harvest. An established tree will tolerate both full sun and part shade, but while it is still young, be sure to shelter it from strong winds and the harsh afternoon sun. It prefers warmth and moisture, so mulch well before Summer and keep it watered throughout the dry season. Ensure a soil with good drainage. Leaves are large and glossy in an attractive shade of dark green. 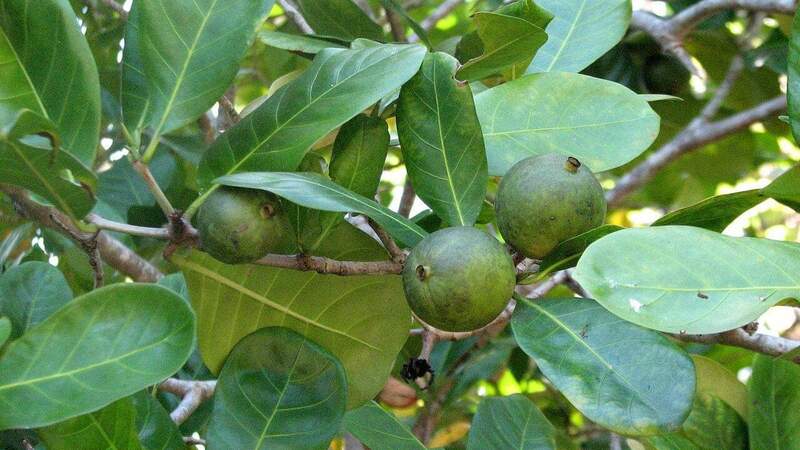 Native Gardenia, when left to grow as a tree, can reach heights of up to 6m, providing some shade. With regular pruning, it may be kept in a pot or at shrub size, making it a fabulous display plant, particularly during flowering season. Why are the leaves of my Native Gardenia are turning brown/black? Young trees are prone to leaf burn in hot dry weather, especially if it gets the full afternoon sun. Shelter the plant while it’s still young, or move it to a partly shaded spot. Why are the leaves of my Native Gardenia turning pale? Like exotic Gardenia, this native species prefers a neutral to slightly acidic pH. How and when should I prune my Native Gardenia? This plan can be pruned to shape any time of the year. When should I fertilise my Native Gardenia? In Spring – use a slow release fertiliser.